Today, I would like to talk about my obsession with leather. I am vague with the term because I am in love with everything made out of this material: pants, jackets, dresses, skirts, tops, shoes, bags … you get the point. Leather has become predominant in my wardrobe over the years. I find myself incorporating a piece on a daily basis. I must say that I love the way it makes me feel. The material brings a unique kind of edginess to the pieces I wear. This is why I say leather is the new denim. 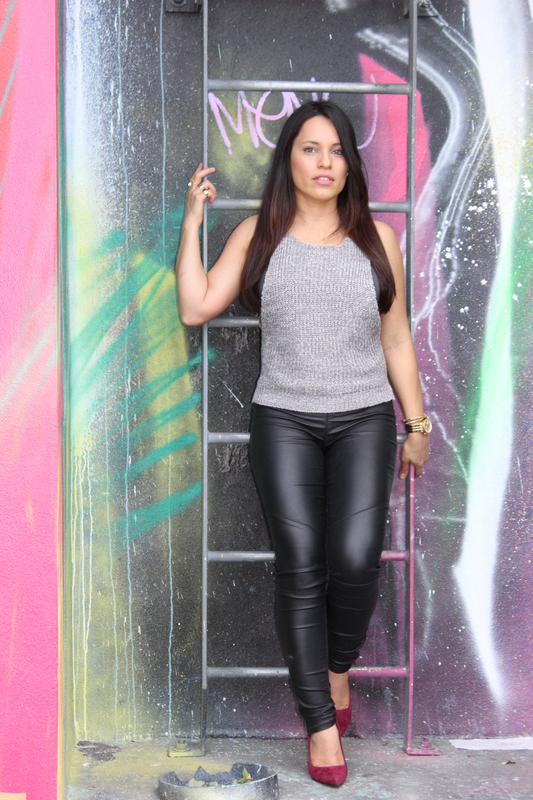 During this photo shoot in Wynwood, I opted for a pair of faux leather pants, a sleeveless knit sweater and suede burgundy pumps. The temperature is slowly dropping so what better way to welcome the cold weather than with this little number. This specific material can bring out great confidence in each of us, therefore, make sure to add a few pieces to your collection.